We are one of largest diversified real estate services company with about two decades of experience in different services related to property, development, construction, maintenance, legal, and financial services. It has one of the best teams of real estate development professionals working on its varied projects. It has already completed more than 30 projects. The moment you step into Haritha Vanam, you are transported to a different realm. The 1000-acre fenced and guarded community oozes comfort. Wide smooth roads, flawless concrete, pockets of shrubs, greenery against pristine blue canvas makes you feel a privileged resident. Tranquility is all pervading as modern designs duet with open spaces of parks and play grounds. Every facility is carefully orchestrated to evoke happiness in you. Avenue plantation, jogging/walking tracks, Old-age homes, clubhouse, underground cabling, ornamental street lighting, make this smartly designed community a fairy tale setting. Thoughtfully designed spaces along with futuristic facilities make it a 'lifestyle so wholesome' whichever way you see. Your dreams are about to unfold. It's a complete world that offers every comfort and facility you dreamt of. It's a lifestyle that gives you a life and style, every global citizen can be proud of. It's where every 'dream turns realistic', every passion is fulfilled and every day a joy. And everything is within your reach. Let's raise the curtains on our dream project- “Haritha Vanam”.With every conceivable facility built around you, you'll agree, life was never 'so complete' before. Address: Hyderabad, Ramanthapur, Hyderabad, Telangana, India. 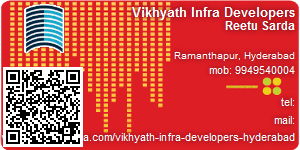 This Builder Profile page for "Vikhyath Infra Developers" has been created by PropertyWala.com. "Vikhyath Infra Developers" is not endorsed by or affiliated with PropertyWala.com. For questions regarding Builder Profiles on PropertyWala.com please contact us.